+44 (0)7415 974879 CONTACT US! Trout & Salmon Front Cover! First of all Happy New Year to all our readers! As the title suggests, this is my first published front cover image! 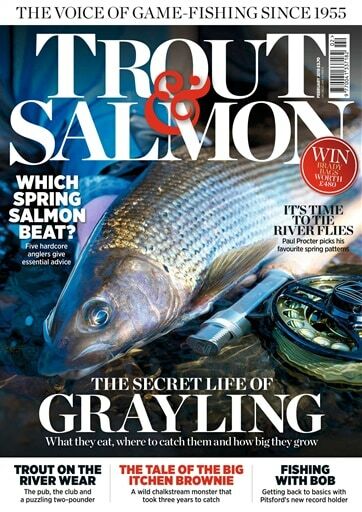 I was delighted to get a call from Trout & Salmon magazine about one of our Grayling images they’d like to feature on the front cover of the February issue of the magazine. Trout & Salmon is undoubtedly the UK’s No.1 fly fishing magazine and features some of the best in the business in their appropriate fields. It needed a little tweaking to fit so I had to wait anxiously before receiving a reply from Andrew Flitcroft that it was all good! It’s been a goal of mine in recent years to achieve this so I am delighted to finally get there. I’ve had a few inside the magazine but including a double spreader but this is the first front cover! The images is a first Grayling for a client I guided on the River Teviot. It is definitely one of my favourite Grayling images! Also great to see our sponsor Loop Tackle on front cover too! What a positive way to start 2018! http://scotiafishing.com/wp-content/uploads/logo1.png 0 0 Callum Conner http://scotiafishing.com/wp-content/uploads/logo1.png Callum Conner2018-02-02 11:56:532018-02-02 11:56:53Trout & Salmon Front Cover! If you have any questions about our services, our company or bookings please feel free to get in touch. OR MAKE AN ENQUIRY HERE. @ 2017 Scotia Fishing - All rights reserved.